So you just concluded a visit with your doctor. You listened to them explain that you have a little arthritis in your back. You returned home wondering… Just what does a “little” arthritis mean? Am I going to be in pain for the rest of my life? To answer concisely (and give you some good news), no- you will not always have pain! Fully understanding why begs a third question: What is arthritis, anyways? So What do all those "Letters" Mean? Arthritis describes a variety of conditions. 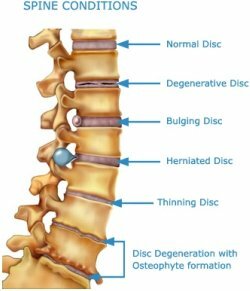 You might hear arthritis described as DDD, which stands for degenerative disc disease. Arthritis can also go by the name DJD, and you may also hear the term stenosis. DDD involves a situation where the cushiony discs between your vertebrae begins to thin and wear out. This thinning creates pressure on the joints and nerves in your back- very uncomfortable. Maybe you’ve heard you have DJD, a slightly different condition where it’s the joints between the vertebrae giving out. They then become inflamed and swollen, producing painful compression on the nerves. Stenosis also describes an arthritic condition- one that can happen in two different ways. In the first scenario, excessive inflammation causes the canal housing your spinal cord to narrow. In the second situation, the area at the base of your back where nerves exit narrows, again putting more pressure on those nerves. Anatomically these situations may be different, but all three can result in discomfort in a specific area of your back, or even pain that shoots all the way down your leg (called sciatica). Now you must be wondering… how can physical therapy help any of this? Your physical therapist should have two primary goals in mind when you begin treatment. First and foremost, we want you out of pain! Recent studies show that manual therapy not only decreases the pain you feel, but also increases your carry-over of relief, even after you leave the clinic. How is this accomplished? Restoring the normal motion of bones and joints reduces the stress and strain on the structures in your back. When this is accomplished successfully, you’ll feel less pain. Once you begin to feel better, the new goal aims to increase the strength of the muscles that support your back, so that you can keep your new found comfort! Still don’t believe me? Let’s look at an offensive lineman playing in the NFL. Statistics reveal very few of these guys have any ligaments left in their knees at all. In fact, their knees are full of arthritis, typically at an unusually early age. So how can they continue to play football without being in agony? The strength of the structures surrounding their joints provides the support to keep normal function. In fact, this strength also prevents the chronic inflammatory process. So don’t despair about your arthritis diagnosis- you will get back to the activities you love!